The 1970’s weren’t just about big hair, leisure suits, and waterbeds. This decade was also a time of tremendous innovation. Barcodes, e-mail, laser printers, video games, personal computers, and genetic engineering all made their debut in the 1970’s. Not surprisingly, this was also a time of horological excellence, with many watchmakers introducing some of their most innovative and enduring designs. One of these groundbreaking timepieces was the original Fortis Marinemaster. As a tribute to this iconic timepiece, Fortis is re-issuing it in a special limited edition of 500 pieces. The Fortis Marinemaster Vintage 800.20.85 L.01 remains faithful to the original design while incorporating technological advancements that make the historic chronograph even better. A proprietary Fortis caliber 2020 automatic movement, based on the reliable Swiss made ETA 2892, now powers this vintage masterpiece. With a modified chronograph module, 47 jewels, a fine timing device and Incabloc shock absorber, this superb timing tool is an improvement on the earlier Marinemaster. Like its 1970’s namesake, the Marinemaster Vintage 800.20.85 L.01 watch features a three-part 40 mm stainless steel case, a specially coated domed PMMA acrylic crystal, an exhibition caseback, and a unidirectional rotating bezel with a clearly marked 60-minute aluminum insert ring. The beautiful black dial features three perfectly placed blue sub-dials at 3 o’clock, 6 o’clock, and 9 o’clock for timing events. There is also a precisely engraved tachymeter scale circumscribed around the edge of the chapter ring. The 800.20.85 L.01 Fortis Marinemaster Vintage has a highly polished, and period correct, stainless steel case that is water resistant to 165 feet. The vintage chronograph has been fitted with a beautiful black genuine leather strap with contrasting top stitching, just like the 1970’s original. If you’d like to own one of the iconic timepieces that made Fortis a favorite among pilots, astronauts, and sailors, this is your chance. With only 500 copies available worldwide, this faithful recreation of a Fortis masterpiece won’t last long. To put a piece of history on your wrist, contact an authorized Fortis dealer immediately and reserve your Fortis 800.20.85 L.01 Marinemaster Vintage watch today. Gevril Group is the sole US, Canada and Caribbean agent for Fortis Watches and the official Fortis watch repair service center. Contact us by email or by calling 845-425-9882. Not many people know that Fortis has a long heritage of over 100 years of continued manufacturing and many accolades to its name. Walter Vogt established the company in 1912 and in 1924 partnered with John Harwood, inventor of the automatic wristwatch. They released the first self-winding wristwatch in 1926 called the Harwood Automatic. By 1937, Fortis moved into chronographs, releasing their first one for the celebration of the 25th anniversary of the company. Fortis has built their reputation on producing tough, functional watches that are equal to standing up to punishing environments. In 1994, Fortis put its watches through such rigors of testing that pushed the boundaries of modern physics that the Russians came calling. The Russian training facility for cosmonauts located in Star City Russia chose the watch, now called the Fortis Official Cosmonauts Chronograph, as part of their official equipment. The watch was put through the paces inside the shuttle and in space, proving its muster by keeping time like the day it was born. Because of the association with the Russian cosmonauts, the Fortis name might initially bring up the idea of a space watch, but the brand has also mastered other environments such as aviation and maritime. The Men’s 647.28.71 L.01 Black Automatic Date from the Fortis B-42 Marinemaster Collection is a capable and good-looking dive watch. Like most tool watches, it comes in a larger 44 mm case so that the dial has more real estate and can be easily visible underwater. The black dial features a day and date at 3 o’clock Arabic numerals with the traditional triangular marker at 12 o’clock, rounded out with baton numerals at 6 o’clock and 9 o’clock. As required by all dive watches, the hands and numerals are swathed in luminescent material. In a stainless steel case covered in PVD, the watch has a very stealthy look that will blend right in by land or over a wetsuit. Of course, every dive watch must have a unidirectional bezel, and the Fortis 647.28.71 L.01 B-42 Marinemaster comes with one. But what make this bezel even more interesting is in addition to the 60-minute display, a 24-hour display is also included. 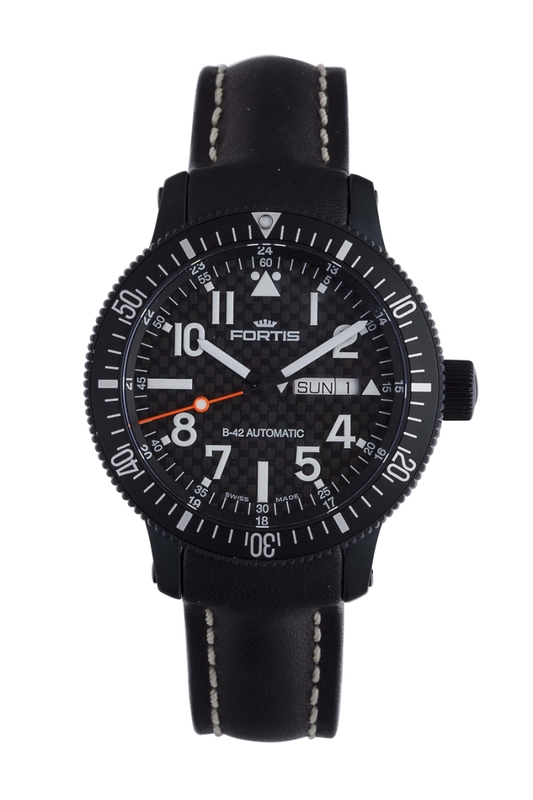 Most dive watches don’t have an exhibition back due to water resistance issues, but Fortis managed to get around that obstacle so you can get a view of the mechanics too. The Fortis 647.28.71 L.01 B-42 Marinemaster comes with an automatic movement with a shock absorber and is water resistant to 660 feet. 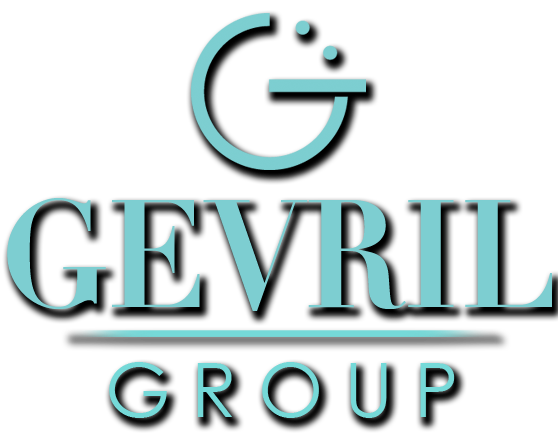 Gevril Group is the sole US, Canada and Caribbean agent for Fortis Watches and the authorized Fortis watch repair service center. Contact us by email or by calling 845-425-9882. One thing that gets some collectors excited is a new variation of a favorite watch. Fresh colors have the ability to revitalize a design and breathe contemporary air into a classic look. The latest version of the Fortis B-42 Marinemaster Chronograph mixes black and yellow – a popular color combination found in nature, in fashion and in design the world over, not to mention in watch collections from brands both large and small. Like other watches in the Marinemaster collection, the B-42 Marinemaster Chronograph is built for life. It starts with a stalwart movement: the ETA Valjoux 7750 automatic, a benchmark among chronographs and veritable pillar of Swiss precision and reliability. The rugged three-part case is constructed of brushed stainless steel and measures 42 mm in diameter. The unidirectional turning bezel is both a visual and functional highlight: the combination of black and yellow is eye-catching, while the deep scalloped edges provide good grip for turning, especially underwater, where the watch is water resistant to a depth of 660 feet. There is more to the bezel: unlike most dive bezels, this one makes a full turn in 120 increments, meaning it is adjustable in half-minute steps. The pip positioned on the bezel at 12 o’clock is luminous and has a blue afterglow. Functional aspects of this Marinemaster do not end there. The crown is substantial enough to grip and is personalized with the Fortis logo; the chrono pushers are firmly inset and well protected. Adding to the watch’s water resistance is a screw-down caseback, which is embossed with a historic Fortis motif. On the front, anti-reflective sapphire crystal provides a clear and scratch-resistant pane. To a novice, the dial of the Fortis 671.24.14 K B-42 Marinemaster Chronograph watch might seem crowded, but it is actually clear and easy to read thanks to the sharp contrast between the white, yellow and black elements. The layout of the sub-dials is based on the Valjoux 7750 movement with a 30-minute totalizer at 12 o’clock, a 12-hour totalizer at 6 o’clock and running seconds at 9 o’clock. These stand out next to the yellow hour numerals. Toward the outside of the dial is the minute-and-second track as well as a tachymeter scale, which is positioned on the angled flange. The hands, hour markers and indices are all coated with Super-Luminova, which glows blue in the dark. The central chronograph seconds hand also has a luminous circle half way up the hand. A tidy set-up on the dial at 3 o’clock includes the Fortis logo as well as the day and date. Both stand out well on white backgrounds. Changing the day or date is a breeze on this watch because the two arrowheads on either side of the day and date windows – one facing down and one facing up – indicate which direction the wearer should turn the crown to make quick adjustments. They might seem superfluous, but the arrowheads are convenient reminders and, in design terms, echo the shape of the traditional arrowhead index at 12 o’clock – which appears in deference to Fortis’s aviation style watches. 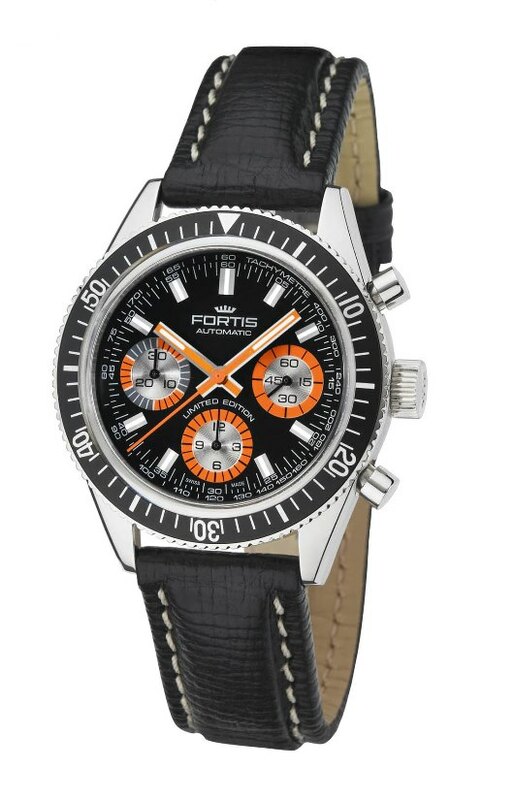 Since the B-42 Marinemaster Chronograph is a seagoing watch at heart, Fortis mounts the watch on a black rubber strap that fastens by way of a brushed steel folding clasp featuring the Fortis logo. But there are options to mix it up; namely, a black leather strap or steel bracelet. 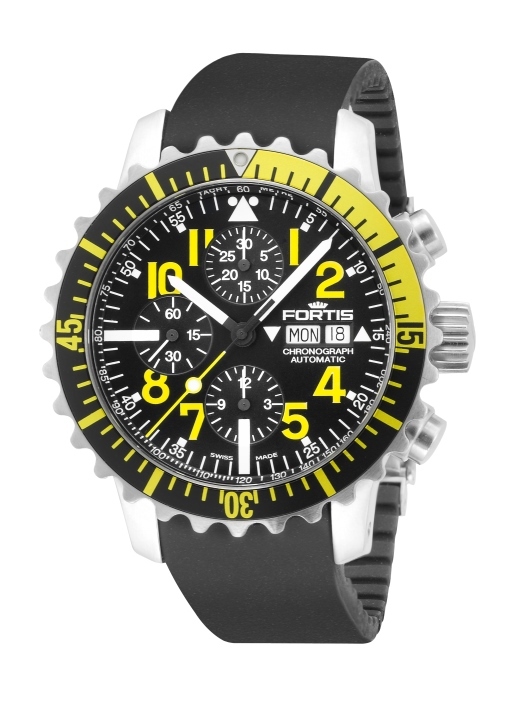 The Fortis Mens 671.24.14 K B-42 Marinemaster Chronograph watch in yellow and black is a vibrant rendering of an enduring classic. Contact an authorized Fortis dealer to add one to a collection that already includes a Marinemaster, or own one for the first time in this highly desirable color palette. Popular culture steers people to explore new and different trends. But some designs continue to work – decade upon decade – and those labeled “classic” always return to favor. Such is the case with the Fortis Marinemaster watch, originally released in the 1940s. The Marinemaster remained in the Fortis lineup for decades, and the Marinemaster Chronograph was popular well into the 1970s when the quartz movement revolution forced the watch industry to rethink its mechanical future. The industry bounced back in a big way, as did many of the classic watch designs of the 20th century. Today, reconnecting with classic watches of bygone eras is as popular as ever. 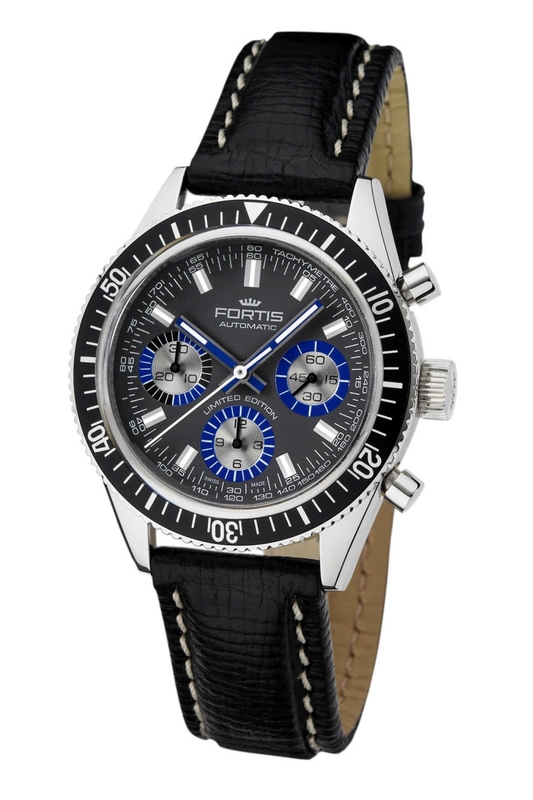 As part of the brand’s centennial celebrations, Fortis released two versions of its Marinemaster Vintage Chronograph in 2012: one with blue accents and the second, shown here, with orange accents. Both are limited editions of 500 pieces. The Fortis Marinemaster Vintage Chronograph watch is true to the look of its predecessor in most ways including the shape of the lugs, the piston-style chronograph pushers and the unidirectional, graduated dive bezel. Similarities extend to the dial, too, including the orange sub-dials; the two-tone 30-minute sub-dial; the shape of the hands and hour markers; the minutes-and-seconds track, and the tachymeter scale at the outside of the dial. Enthusiasts will note that the position of the 30-minute counter and the 60-second counter are reversed compared to the ’70s iteration, which is a result of the configuration of the new automatic movement – the Fortis caliber F-2020 – an ETA 2892-A2 base with a Dubois Depraz 2020 chronograph module. Other than the upgraded movement, the most notable difference is the watch’s exhibition caseback that provides a view of the movement in action. The water resistance of the Marinemaster Vintage Chronograph is 165 feet (less than the original, which was over 650 feet). The three-part case is made of stainless steel and measures 40 mm in diameter. Another nod to the original is the inclusion of domed acrylic on the front that is made of PMMA – the same type of acrylic that was used before the advent of synthetic crystal. The watch is mounted on a black calfskin strap with white stitch and employs a traditional clasp buckle. If the reliability of a modern watch is more appealing than the quirks of vintage, or a vintage model simply eludes capture, consider the Fortis Marinemaster Vintage Chronograph watch. Its classic retro design in tandem with an updated automatic movement will remain a favorite long after the whim of the next style craze.